If your circadian rhythm is disrupted, your ability to get quality sleep will suffer. But it isn’t just about sleep — the circadian rhythm is a key player in many aspects of your health including stress, energy levels, and even weight loss. Read on to learn more about how you can keep a healthy and balanced circadian rhythm. Top 25 Methods For Better Sleep and Circadian Rhythm Entrainment. These processes have a certain rhythm or flow. The body conducts this orchestra with ‘clock genes’, which get activated in many cells in the body in a synchronized way. Circadian biology has a massive influence on energy balance and metabolism (R). Many hormone receptors have been observed to exhibit circadian rhythms of expression (R). The daily timing of food intake has itself been shown to affect body weight regulation in mammals through the regulation of genes that control metabolism (R). In particular, clock genes control NAD+/SIRT1, which if you have low levels of these proteins, your mitochondria won’t work well, you’ll be tired and your metabolism will be slower (R). Many variations in genes of the circadian rhythm raise the risk of diabetes (R). If your circadian rhythm is off, the quality of your sleep will suffer considerably. The circadian rhythm is the key to health and weight loss. Hence, why this is more important than sleep. At the protein level, a healthy cell will progress through a daily cycle of alternating metabolic states directed by the circadian system, with proteins going through cycles of being synthesized and degraded (R). During periods of fasting, cells release nutrients for recycling and remove damaged or unnecessary organelles (cellular structures). This is known as autophagy. 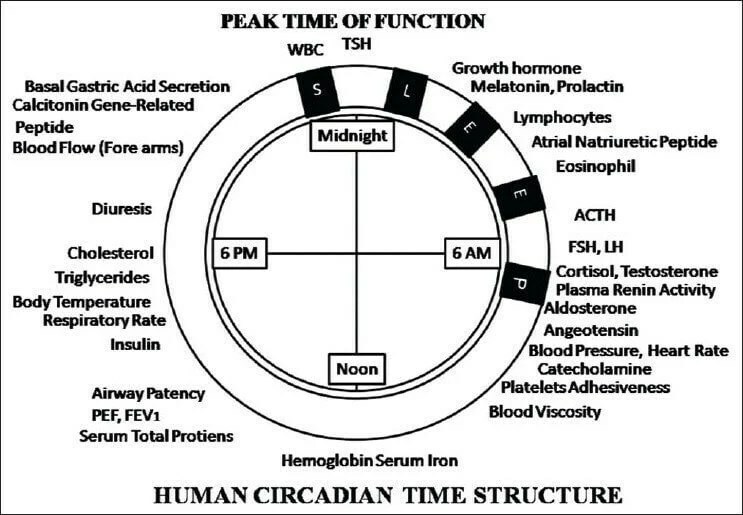 In the liver and other tissues, this timely progression is controlled by your circadian clocks (R). Part of circadian modulation of autophagy includes establishing particular phases of day or night when the neurons are more susceptible to aggregation and mitochondrial dysfunction, and potentially this would be exacerbated by circadian and/or sleep disturbance which would reduce the daily peak capacity for autophagy (autophagy works via circadian expression of the transcription factor C/EBPβ) (R). A zeitgeber or time giver is a biological cue for the time of day. Our body needs these clues to know when to synchronize different activities. The most significant zeitgeber is the light-dark cycle. The environmental information goes through the retina and the retinohypothalamic tract to the Suprachiasmatic nucleus in the hypothalamus (R). Other zeitgebers include temperature, tides, social contact, and food availability, among others (R). It’s important to realize that there is the central clock in your hypothalamus which has light as the predominant zeitgeber and there are peripheral clocks in cells outside your brain such as your liver. Feeding/starving cycles are dominant zeitgebers for many peripheral clocks (R). Food metabolites such as glucose and/or feeding-related hormones such as glucagon and insulin have been proposed as likely candidates for phase setting of peripheral clocks (R). Given the multitude of signals able to generate circadian rhythms in tissue culture cells, it is likely that a variety of different pathways are also used to synchronize peripheral clocks (R). Getting rid of blue light at night is critical to your circadian rhythm. The green light has some melatonin blocking effects as well, so that’s why red glasses are ideal. However, even red light at night increases alertness even though it doesn’t inhibit melatonin release like blue light, showing that melatonin suppression is not required for light-induced nighttime alertness (R). In animals, light at night alters daily patterns of cortisol and clock proteins (R, R2). In humans, also alters circadian clocks (R). The problem if you keep to these tips, people will think you’re a freak. You have to make a calculation if you’re health is worth it, and you can mitigate weirdness in various ways. If your mate isn’t on board, it will be tough. I’m dating someone who is on board with this because I know it’s difficult if this isn’t the case. You must block out blue light after the sun goes down mostly. I recommend the Orange Glasses to be worn when the sun starts going down. You can wear them starting in the afternoon if you wish when you’re indoors, but I only recommend that to the people who have more serious issues. Blue light destroys the DHA in your eyes and disrupts the signal to your hypothalamus (SCN). I recommend you wear red glasses for at least 2 hours before bed. You must turn off all artificial lighting and use these orange bulbs at night. If you get any kind of light at night that isn’t filtered, it will throw off your circadian rhythm. This includes the light bombs that come from outside. I also use the popular f.lux program to block out blue light. I use the f.lux program all day. I use Twilight and Bluelight Filter for Android. Jailbroken iPhones can have f.lux installed. Otherwise, I haven’t found programs in the IOS app store yet. Another good idea is to have Blackout Curtains, especially if you live in a city. Orange Glasses are important if you have a night shift job. There should be no light whatsoever in your room. Use a sleep mask if need be. Use Red Sheets that block blue and green to cover iPad or other screens. I’ve actually put these on my windows to block out stray lights from outside because in NYC light bombs are the norm. If you need to go outside, you should wear red glasses and a hat/cap to block artificial lighting from above. A mere 5 lux of light (a tiny amount) can disrupt your circadian rhythm (R). Compare that to the bright light devices that are 10,000 lux and bright sunlight, which I believe is 50,000 lux. This low level (5 lux) is present in your room even if you shut your lights off but have a night light, or if you are getting light from outside at night, which is the case if you live in a city. These low levels of light alter core circadian clock rhythms in the hypothalamus. These changes were associated with time alterations in eating and increased weight gain in mice (R). People who had delayed phase sleep syndrome (and likely people who are just night owls) experienced lower melatonin levels in response to light at night (R). This means if you’ve got insomnia, you definitely need to follow this tip. If you have light colored eyes (light-eyed Caucasians), you will be more susceptible to melatonin suppression by blue light than if you had darker eyes (dark-eyed Asian) (R). Not eating a meal at least 3 hours before bed is critical and 4 hours is ideal. If you feel hungry before bed or at night, you must increase your calories in the day. On the rare days where I just missed eat until later, I simply use 1tbsp Ghee, 1tbsp Raw honey, and 1 tbsp Collagen whenever I can before bed. In the beginning, if you’re getting hypoglycemic, you need to have some honey before bed. But if you are following the lectin avoidance diet and keeping to a circadian rhythm, that will disappear after a few weeks at most. Getting outside first thing in the morning to get light and reset your rhythm is important. It’s also helpful to use a dawn simulator and also a bright light device if you aren’t getting bright light in the morning. If you aren’t getting outside within 30 min of waking up, then you need a bright light device. The Bright light device is large and it’s good to put at your workstation if you use your computer first thing in the morning. I also have a portable Bright Light Device to put on a cap. I use this EMF Cap with it. You want to use these for a maximum of 15 minutes just to reset your circadian rhythm. Again, if you can get outside within a half hour every day, then you don’t need this. You’re much better off getting outside. Studies have found that melatonin is more easily suppressed in the winter than the summer by light in Japanese (R). This is presumably because not having enough bright light in the day predisposes you to increased circadian disruption with light at night. Night owls exposed only to natural sunlight had a more significant change in the time they went to sleep (they went to bed earlier) (R). See this video in which this researcher mentions how the sun is important for setting your circadian rhythm. I’m pretty bad when it comes to this, but going to bed at the same time can be useful for programming your circadian rhythm. I’m working on it. Psychological stress will throw off your circadian rhythm. Stress hormones (CRH, cortisol) have the effect of delaying the circadian rhythm. This is why night owls are more of an anxious phenotype. And it’s not only psychological stress. Anything that activates your HPA axis or stress response is included. I made a list of dozens of HPA triggers. Not exercising within 4 hours of going to bed is a good idea. Exercising at ~5 pm can sometimes be ideal for sleep, but don’t exercise at 9 pm and go to sleep at 11 pm. You want the vast majority of your calories and especially protein in the morning and afternoon. 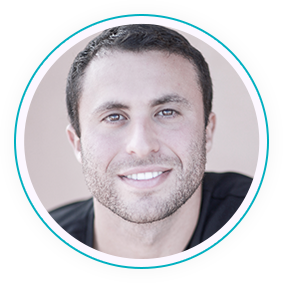 Protein jump-starts your metabolic rate and this is better close to the time you wake up. You shouldn’t have your biggest meal for supper (last meal), as is common in the US. People might have their largest meal for supper because they might not want to be fatigued in the day or more likely because they don’t have time to eat in the morning. I get it, but it’s time to change. You should construct your meal size based on if you get hungry before bed or in the middle of the night. If you’re hungry before bed or you wake up in the middle of the night because of hunger, it means you didn’t eat enough in your last meal or in the day in general. Up your calories of lectin free foods and seafood, especially for breakfast. You will not get tired if you only eat 12 ounces of wild salmon and no carbs or oils (unless you have an allergy). I usually fast for 12-14 hours a day because I will stop eating at about 7 PM and eat breakfast at maybe 8 AM. This fluctuates. You want to ideally go to sleep at 10 PM and wake up at 6 AM. You don’t want to go to bed at 12 PM like I do. I am working on this, with some limited success. I seem to be able to go to bed earlier, but the key for me is to do it EVERY DAY, not just most days. I find I’m most successful when I aim to get to bed at 9 and then I end up getting in bed at 11. When I aim for 11, I get to bed at 1. If you have chronic oxidative stress, inflammation, hypoxia or mitochondrial issues, then fix it. Each of these disturbs your circadian rhythm and they are also increased by a disturbed circadian rhythm, creating a bad vortex. For me, food lectins were most significant in giving me inflammation and disrupting my circadian rhythm, but this was far from the only trigger. Your mitochondria are supposed to be more active in the day and you’re supposed to utilize oxygen, which results in superoxide. Bursts of superoxide will help you create new mitochondria. When your mitochondria are working well, you will build up healthy levels of ATP and NAD+ levels, which are important for energy utilization and metabolism. Healthy levels of these will allow you to be alert and energized in the day and tired by nightfall. The mitochondria create ATP. ATP converts to cyclic AMP, which is a critical messenger molecule for so many cellular processes. cAMP is needed for the regulation of glycogen, sugar, and lipid metabolism. The phosphates from ATP activate proteins that act directly on the cell’s ion channels. Through PKA/CREB, it leads to the production of gene products. The following hormones also require adequate cAMP levels to function optimally: FSH, LH, ADH (V2=kidneys), TSH, CRH, hCG, ACTH, MSH, PTH, GHRH, Glucagon, and Calcitonin. Cyclic AMP turns on PKA, which converts ATP into AMP, which ends up converting to adenosine. Adenosine builds up throughout the day and causes you to feel tired as the day goes on. Orexin also has a sharp drop off and you feel like you need to go to sleep. If your mitochondria aren’t working, you don’t produce optimal levels of ATP, cyclic AMP, AMP, and adenosine. You need adequate oxygen for your mitochondria to work well. Chronic inflammation and/or oxidative stress will cause your mitochondria to slow and you won’t utilize oxygen well. Low oxygen will lengthen your electron transport chain and cause increased superoxide per ATP produced (Kruse). Some people like to have a thick blanket to snuggle on at night. This will make you warm and disturb your circadian rhythm. You’re supposed to be cooler at night and your body temperature should drop. cAMP resets the circadian rhythm. If you take forskolin, which could help you with weight loss, take it right when you wake up. Exercise also increases cAMP, so it’s not a bad idea to wake up and do some push-ups or take a quick sprint. Selenium and proper methylation are important for circadian functioning. Almost all herbal or other supplements should be taken in the morning or afternoon. The exceptions are raw honey, magnesium, glycine, herbs meant to put you asleep (valerian, passion flower) and perhaps a few others. Unless you have a clear reason to use it at night, use it in the morning or afternoon. I used to support some supplements to make you drowsy before bed, but I am now careful. I use them only when people suffer from insomnia. Music and socializing are zeitgebers, which can indicate it’s daytime, so keep these to the earlier parts of the day (or restrict at night). Oxygen can also reset the circadian rhythm and help jet lag (R). If you use an oxygen concentrator or hyperbaric machine, it should be done in the AM or afternoon. Anything that increases NAD+/SIRT1 should be done in the morning/afternoon. In the morning, light on the retinas signals the SCN to shut off melatonin (R). Prolactin is secreted early after sleep onset and rises through the night (R). GHRH spikes at about midnight while growth hormone gets released a bit later. TRH spikes at 3-4AM, followed by TSH, T4, and T3. Metabolism is lowest at about 4 AM and this corresponds to our lowest body temperature. Toward the end of the sleep phase, before early morning, the renin-angiotensin system kicks up. This increase causes aldosterone to also increase (before cortisol rises) (R). Cortisol spikes at 6 AM. CRH and ACTH precede the cortisol spike by an hour or so. Aldosterone and cortisol both cause a blood pressure spike. VIP is highest at 6 AM and lowest at 6 PM. In lean people, ghrelin rises rapidly at midnight and peaks about 2:30 AM, but not in obese people, where it stays flat (R). This burst of ghrelin stimulates growth hormone. Ghrelin continues to be high until the morning. Ghrelin stimulates NPY in the hypothalamus increasing our desire and ability to eat a lot more. Melatonin is known to acutely decrease ghrelin. Light at night can disturb the ghrelin release (R). Leptin rises as the day goes on and peaks at midnight and is at the lowest point between 9AM-12PM. The timing of your meals affects when you have a peak of leptin (R). Leptin makes NPY decline normally, but if one is leptin resistant this does not occur and appetite is out of control at the brain level. Testosterone secretion peaks at about 9 AM. This is preceded by FSH and LH secreted at about 6 AM. At 6:30 PM we see our highest blood pressures due to changes in atrial natriuretic factor and antidiuretic hormone (ANF, ADH). Heart attacks often occur in the morning. Epileptic seizures peak in the late afternoon. Asthma attacks get worse and more deadly between 11 p.m. and 3 a.m. (R). In the morning, the immune system may be overactive, inflaming airways in asthma sufferers and swelling arthritic joints. (R). Blood pressure and heart rate start increasing in the morning due to cortisol (R). Heart attacks and strokes peak at around 9 a.m, partly because of the higher blood pressure (R). Also, a substance called PAI-1, which makes blood clot more readily, peaks around 6:30 a.m. (R). GERD may be higher at night. Stomach acid production peaks between 10 p.m. and 2 a.m. (R). Metabolism/mitochondrial production of energy, the sun, and detoxification of food-derived toxins create free radicals in the daytime, which then elicit an antioxidant response in a cyclic manner throughout the day (but oxidative states are focused in the daytime and antioxidant response at night) (R). In the late afternoon and on we see more antioxidant gene expression (R). During daylight hours, we see increased Nrf2 gene expression, and at 6 PM, we see a peak in NRF2 protein (R), which are your body’s core antioxidant defense system. If your clock is broken, you will have higher levels of oxidative stress (R). PPAR alpha and gamma, the protein responsible for metabolism, are also active in the day and are controlled by CLOCK/BMAL1 (R). When your cellular clock is disrupted, it results in a deficiency of NAD+ because NAMPT, the enzyme that makes NAD, is controlled by clock proteins – BMAL1 is especially important for this (R). Less NAD+ leads to a reduction of SIRT3, which is necessary for metabolism and mitochondrial function (R). Some part of your immune system is elevated in the day and some at night. TNF, IL-1, IL-2, IL-6, and IFNy are elevated, in part because of melatonin (R). TNF–α, IL-2, and IFN-γ likely work in part by inducing slow wave sleep, which makes us more resistant to infections (R). T cell numbers and its reactivity were stable during the daytime, whereas a significant increase was observed in the late evening and early morning hours (R). This is why people with arthritis have a “morning stiffness of joints,” because of these aspects of the immune system peak from midnight to early in the morning (R). Cytokines, such as TNF, can change your circadian rhythm, so the effects are bidirectional (R). Per2, which peaks toward the early evening, increases natural killer cell activity (R). Mice deficient in the core circadian CLOCK gene develop obesity. These mice have reduced levels and a flat rhythm of orexin, a neurotransmitter that increases energy metabolism (R). Mice deficient in another circadian gene (Bmal1) had defects in insulin secretion, both at base levels and in response to glucose stimulation. These mice were highly susceptible to diabetes (R). Fat cells also need BMAL1 to develop (R). When mice were bred without BMAL1, they lost weight (R). So a BMAL1 deficiency could cause weight loss as a result of less fat cell production and lower insulin secretion or weight gain. I see both excessively thin and obese people having circadian rhythm problems. The obese people might have a problem with the CLOCK gene and the thin people might have an issue with BMAL1. In mice, deficiency of BMAL1 leads to increased ROS levels in several tissues (R, R2), which is an issue my clients deal with. Adequate BMAL1 is needed for the production of vasopressin (R), which is something low in my clients. Adequate BMAL1 is needed for the production of hypoxia-inducible factors (R), which is something that I’d guess would be low for my clients because they often have low EPO, which needs HIF (R). A BMAL1 deficiency should also correlate with higher LDL cholesterol levels because BMAL1 (and CLOCK) are needed to increase LDL receptor genes, which swallow up LDL (R). Mice bred without BMAL1 are infertile, small in stature, age quickly, and have progressive pains in joints and are more sleepy and less active (less overall locomotor activity) than normal mice (R). BMAL1 (and CLOCK) increases gene production of NAMPT (R), which is crucial in converting niacin (also called nicotinamide) to NAD (R), which is what puts the pedal to the metal of metabolism. So less BMAL1 means less NAD+, slower metabolism, and energy production (R). NAD+ is needed for SIRT1 (R), which increases orexin 2 receptors (R), which is important for wakefulness (R). Having less BMAL1 will result in less SIRT1 protein and activity (R). Having less BMAL1 will also lower PPAR alpha (R). Having too little BMAL1 will ruin your sleep, which many of my clients have sleep problems. Histaminergic neurons are silent during sleep, and start firing after waking. Histamine, made by the enzyme histidine decarboxylase (HDC), enhances wakefulness. Mice that don’t have BMAL1 in histamine cells have more fragmented sleep, prolonged wakefulness at night, shallower sleep depth (Less SWS or N3), hindered recovery sleep after sleep deprivation, and impaired memory (R). BMAL1 is lower in people with Bipolar (R). Overall, a BMAL1 deficiency fits with the thin phenotype client who has sleep problems and can’t gain weight. BMAL1 increases muscle production (R) – through MYOD1 (R). BMAL1 increases the Nrf2 antioxidant protein, which decreases oxidative stress. The free radicals cause pancreatic beta cells to malfunction and decrease insulin release (R). BMAL1 increases hair growth. Mice deficient in BMAL1 had a delay in hair regrowth after shaving (R). BMAL1 controls certain kinds of inflammatory monocyte (R). BMAL1 increases genes involved in hormone production, including Star, Cyp19a1, Cyp11a1, Hsd3b2, and Lhcgr (R). Cyp11a1 makes a protein (Cholesterol side-chain cleavage enzyme) that converts cholesterol to pregnenolone (R). Star is the rate-limiting step for hormone production. It transports cholesterol to the inner mitochondrial membrane to be transformed into pregnenolone. Recently, it has been found to play a role in creating bile as well (R). Hsd3b2 plays a crucial role in the synthesis of all classes of hormonal steroids. This gene is predominantly expressed in the adrenals, ovaries and the gonads (R). The HSD3B2 gene provides instructions for making the 3β-HSD enzyme, which is necessary for the production of progesterone, testosterone and ultimately cortisol, aldosterone, and estrogens. CYP19A1 is a gene that makes aromatase, the enzyme that transforms testosterone to estradiol. In the male, the LHCGR has been identified on the Leydig cells that are critical for testosterone production and support sperm production. LHCGR is also important for female fertility as well (R). BMAL1 (and CLOCK) is also important for GnRH receptors in the pituitary gland (R). This receptor receives the signal from the hypothalamus (GnRH) to produce LH and FSH. BMAL1 increases the nerve growth factor receptor which can bind to NGF, BDNF, NT-3, and NT-4. This can mediate neuron cell survival. BMAL1 plays an important role in adult hippocampal neurogenesis by regulating neural stem/progenitor cells (NSPCs). This ties various neurological/psychological disorders linked to adult neurogenesis and circadian rhythm (R). BMAL1 (and CLOCK) increases PGC-1a&b (R) and SIRT1 (R). BMAL1 (and CLOCK) represses glucocorticoid receptor NR3C1/GR-induced transcriptional activity by reducing the association of NR3C1/GR to glucocorticoid response elements (GREs) (R). People with Gestational Diabetes have lower BMAL1 (R). I purchased an exercise program that proposes to be based around hormone and circadian rhythm optimization. It stresses doing high intensity cardio in a fasted state around 6 am before breakfast and strength training around 5 pm. I was wondering what your thoughts are on this and could this increase ones chances of a cardiac event doing high intensity exercise that early? I am a musician; in regards to “music and socializing as Zeitgebers” does that mean that playing concerts or going to concerts will have negative impact my circadian rhythm? Are there any studies that I can read on further about this? My understanding is that the SCN/ light sets body temperature. I am wondering if there is anyone tracking their body temperature to see if it does indeed peak at 7pm and if there are people for whom it doesn’t, who need to do more work to balance circadian rhythm, and if this simple diagnostic could guide their hacks? Anyone heard of this? or is circadian body temperature too stubbornly resistant to being altered by lifestyle for most people? I know the thermometer is sensitive enough to track the daily curve because I’ve seen it in myself for metabolism/thyroid hacks. They also say if you have adrenal problems your temp will be all over the place. I have “adrenal fatigue” and this isn’t the case for me, but if generally true it could be an indicator that circadian rhythm is more likely to be wacked in those people. The temperature should be within a pretty narrow range, and to take it all day you’d want a digital device that continually collects data rather than taking it at different time points. (I’ve also had my fair share of collecting things on a time interval :p) There are definitely factors like movements and heat/cold exposures etc that will make the temperature vary. 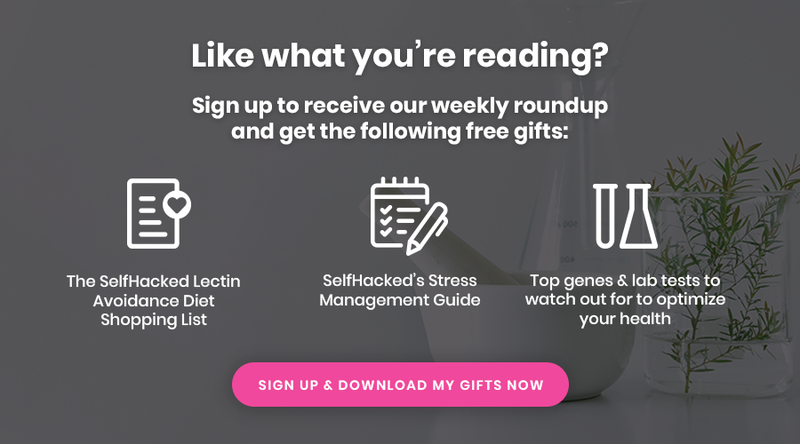 In the Power of When book, Dr. Breus says if you take a warm shower before bed, blood goes to the periphery so your core temperature drops and it’ll be easier to fall asleep. If you take a cold shower, then all the blood goes to the core and so you are actually warmer. If you really want to know whether your temperature fluctuates per all the hormones that fluctuate, you’d have to be in bedrest not to see the fluctuation from all these factors. How can you block unwanted Prolactin which Peaks at around 2a.m. according to your Chart.? Hi Joe, Can you please say what’s the difference between the orange and red glasses? I have the orange ones, are they not blocking all the blue light? I couldn’t find this info anywhere so would be really happy to see your reply. And regarding the red RUBYLITH sheet. Can I put it on a macbook? If yes, what do you do when you actually want to see “normal” colors on the screen in the daytime? Do you keep taking it off and putting it back on? Is the red RUBYLITH sheet at all necessary if I am using f.lux? By the way, why do you use f.lux all day? Is there something wrong with blue light during the day? 1. A suggestion for checking whether your yellow/amber/orange/red goggles* are blocking blue light: Take a CD out into the sunshine and position it so that you see very clearly the rainbow on the shiny side. Note the blue (and green) area. Put your goggles on and note whether you can detect any blue or not. * If you are going to bother blocking blue light, might as well get goggles. Glasses are not going to be as effective. You can get goggles with tiny air vents back nearest your ears for comfort. 2. During your morning and mid-day you NEED blue light so you do NOT want to cover screens to block it during that time. Block blue light X hours before bedtime; experiment with timing. One way to make the colored sheet easily removable is to staple the sheet to something (fabric?) about the same size to make a sleeve of the right size for your monitor/screen. 3. F.lux does not block (all) blue light. It is pleasant to use and it changes light properties according to the clock with little (or no?) effect in daytime. If its schedule doesn’t fit your sleep timing, change your location in the program until it works well for you. While blocking blue light for hours, don’t make the mistake of thinking that just a few seconds of blue light won’t hurt. Those few seconds will reduce the flow/production of melatonin. The not-for-profit organization Circadian Sleep Disorders Network (CSDN) has a lot of information on its website. Here’s the URL for their infographic; check out the rest of the site as well. my bright light devices and sauna. I also get bad fog and fall asleep after the bright light usage. I suspect nitric oxide production is too high and I should just lower time spent with devices. Joe, do you care to comment? Hope you are doing great! Just a quick (quite stupid) question, but I seriously couldn’t find an answer on the internet, so thought I would ask. I thought you might have an answer. About blue light – does watching a movie in the cinema also exposes you to blue light. It is always said about electronic devices, but I couldn’t find anything about the cinema. If you have any idea, I would appreciate it! I wanted to make a comment that might help someone..not all info applies to everyone..
Vitamin D taken from 3-4pm also gives me deeper sleep (morning/afternoon vitamin d reduces sleep) and restarted dream cycle. My longer comment failed to post, so I’ll leave at that for now. 1. what time do you go to bed…so i can work out how many hours before bed you take your d3. & possibly adjust my timing. tho initially i’ll probably try 3-4 pm anyway. 2. how much d3 are you taking (i currently take 2000 IU daily between 9&10 am). 3. how long did it take before you noticed improvements with your sleep. 4. have you had your d3 level tested, was was it? (please include units so i can convert in needed and compare with mine). …was was it? (please include units so i can convert in needed and compare with mine). …what was it? (please include units so i can convert in needed and compare with mine). Is there a significant difference between orange vs red glasses and are they to be worn at different times? Different times – red 2 hours b4 bed. Orange after like 5PM. Great, just had to clarify that. Is it due to the difference between orange vs red in blocking light spectrum? What about supplemeting with 1mg melatonin – do you recommend it for people who wsh to get their circadian rhythm set? 1. if I wear orange glasses at night (to cover my eyes) but am still exposed to uv and blue lights; is it enough or do I want to find ways to cover the rest of my body as well (basically, im usually in my trouses in front of my pc/tv at night with the red glasses on)? 2. is chewing gum before bad bad for circadian rhythms? Thanks! but optimally (and scientifically), would you say it is better to eat within 1h of waking up? You said you were sleeping really well after you got the Magnetico.,, did that effect wear out? How far would you say that a Magnetico by itself goes to correct CR? I eat an average sized meal 1 hour before bed, and I like to think my my circadian rhythm is currently top notch. I wake up and sleep the same time every night and never have problems falling or staying asleep. When I wake up I feel very refreshed and energised for the day ahead of me. Could I really see extra benefit from not eating any food for 4 hours before sleep? Prob worth defining your take on dinner & supper for your international audience (or using alternate descriptors or ballpark times). When I was growing up in the UK, the neighbors would call the kids in for dinner…at noon. Biggest meal dinner? Define dinner…..i recently adjusted my circadian rythms with a big breakfast upon rising and a second meal around 4 pm sometimes earlier no snaking….this cured my dawn phenomena.